Wednesday I have a big pack of bone-in chicken thighs, so I’m going to cook them in the crockpot Tuesday night to make homemade chicken broth, then cook our favorite Tortilla Soup in the slow cooker all day Wednesday. Thursday Using the leftover cooked chicken from the broth cook, we’ll have chicken tacos with black beans and brown rice. We didn’t eat out TOO much on vacation, but it’s still nice to get back to healthier family dinners. Hope you have some good meals planned for this week, too! 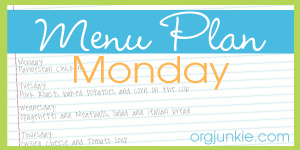 For inspiration, head over to the Menu Plan Monday linky at OrgJunkie.